May | 2015 | Building Solutions. Below is a list of 20 common oversights churches make in the planning, designing, and construction of their projects. While most of these depend on the type and denomination of your church, these should help you when thinking about your project! Building committee is too big: We recommend a building committee to be no more than 5 individuals. While it seems advantageous to have every stakeholder on the committee, in reality it may severely slow the process. During design and construction, communication slows with every person added to the team. Limiting but empowering the committee will keep communication flowing and your project on track. Pastor is on building committee: We all respect that the Pastor is the head of your church but unless he or she is on every committee as well, the building committee should be treated no differently than other areas of the body. The Pastor should be involved heavily in the vision-casting and early design, but there should be a group that comes alongside him to handle the day-to-day, including seeing that vision comes to reality. Building spaces for a single purpose: Many churches build for Sunday, overlooking how the facility will be used the rest of the week. Depending on how you use it, this may be fine, but often churches are utilizing their facilities for weekly small groups, seminars, food banks, mission bases, community meetings, and even birthday parties! For this reason we may recommend making most spaces multi-purpose, i.e. non-sloped floors and moveable seating in the sanctuary, and large open classroom-style spaces that can be divided for smaller meetings or prayer groups. Believing “if you build it they will come”: During programming, we typically view 5 years of attendance records and then forecast out 20 years based on those growth rates. This allows us to see how much you need now and in the future. Many churches want to dramatically increase their capacity with the belief that once they build their project, the people will come. While this may be true if you are routinely at 80%+ capacity and turning away people during Easter, most of the time a more pragmatic size is called for. More seating can still be planned for in the long-term Master Plan. 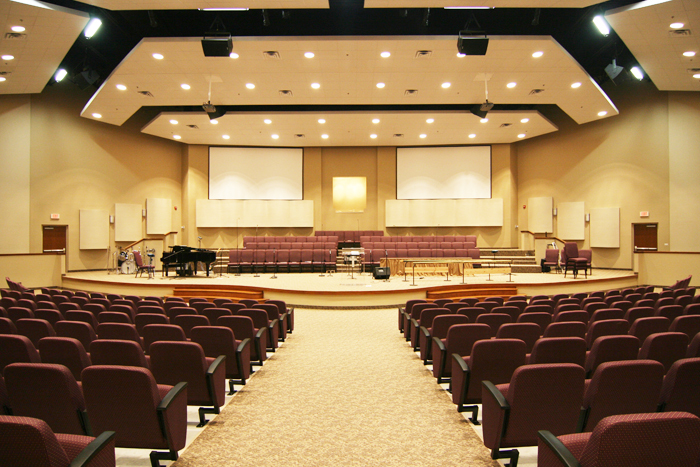 Designing a facility away from their purpose: What kind of church are you? Do have a vision statement? A mission? Is your focus on winning souls? Serving the community? Missions? Like a family buying a new home, a church project is one of the biggest investments your church family will make. You must know and understand your vision before you begin (and so should your design/builder!). It will serve as the compass that guides all decisions throughout the process. Not budgeting enough for AVL: As our friend Doug Hood from CSD says, “Audio, Visual, and Lighting (AVL) is the modern version of stained glass”. He means that it makes people reverent and in awe of the Lord in much the same way. Many modern churches (and church-goers) want a fully immersive worship, including concert hall sound, theatrical lighting, environmental effects, and a fully controllable experience. You may need up to 20% of your overall cost devoted to AVL to achieve this, including audio engineering your space, depending on the type of experience that you would like. Building “in the sky”: Often, we are asked to join the process well into initial planning and budgeting. The committee or leadership team may have already received information from a variety of sources about costs for new construction or remodeling. This information ranges in relevancy, but one thing is almost always certain, it leaves out your land! Sometimes churches build their building using their entire budget “in the sky” with no consideration of the cost to put it on their property. In Florida, site work, utilities, road ways, etc. can be very expensive and should be considered at the outset. Hiring a builder after design: I know, I know, big surprise… we’re telling you to hire us early! There’s a practical reason for it. If you have not hired one party for both design and construction, you will still want to hire your builder as soon as possible. Only your builder will have real-time information on costs that can be applied during design. Your builder also knows the submarket, and new trends in construction. Make a complete team so that you have checks and balances throughout the process. 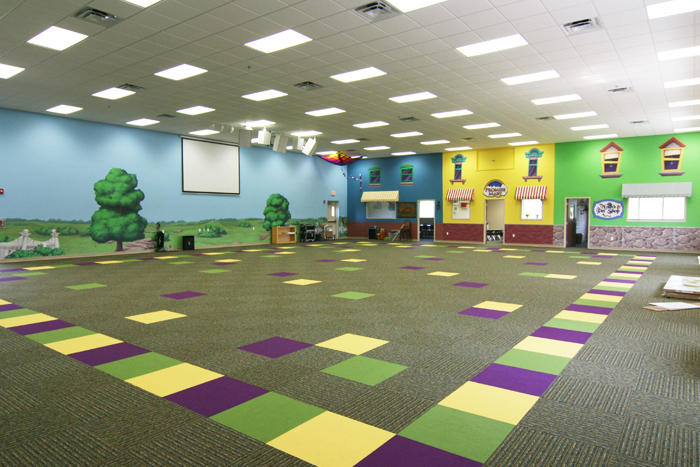 Overlooking children’s space: The secret is out: Modern churches have realized that if you get the kids, you get the parents. Nothing keeps mom and dad coming week after week like little Johnny pestering them to go back to the cool place all their friends are. Because of this, specialists like our partners at Worlds of Wow have come along to help churches get the “coolest” bang for their buck, from wall murals to 3-story playgrounds. Only focusing on the initial cost: Here’s a stunning statistic: After 40 years of operation and maintenance, the cost of design and construction of your facility will represent less than 1% of the overall cost! Make sure your builder is not only finding the lowest possible initial cost, but choosing materials and components that have full life-cycle considerations. This goes from paint to mechanical systems, including efficiency. Using church members in design and construction: This is common but can be a big no-no depending on the skill of your member. Regardless of their heart for the project, unless they have done a similar project and scope as yours, it is not advised. Even if they have, it can be a very awkward situation if they get into the project and become the center of an issue. The best way to handle this is to have the member vetted by the designer and builder. A better way to utilize interested members is on committees or sub-committees. Doing their own capital campaign: Traditionally, you can raise 1 to 1.5 times your annual tithes and offerings by doing your own capital campaign, while hiring outside professionals can increase it to 2 to 3 times the same amount! Generosity consultants, like fellow NACDB members Generis, can walk you through every step. They do this by helping you teach what the Bible says about generosity, not by passing the plate more often. Once your congregation understands a generous heart, they will give even beyond the need. Having a professional consultant aboard may also lower your loan interest rate, or increase the loan amount your lender may give you. Designing beyond their budget: We often see church leadership designing their dream facility without bending even when the costs exceed their ability. We as builders can help by phasing and value-engineering, but often that is not enough to overcome the gap between what is desired and what is possible. We advocate being good stewards with your resources. Your project should fall in your budget, including a hefty contingency amount for unforeseen circumstances. If all goes without a hitch, the contingency can be used to upgrade finishes or on other needs. Not allowing enough time for design and permitting: No matter what city or county you are in, write down a number of months you expect design and permitting to take. Now double or even triple it! Churches are always very surprised at how long the design and permitting process may take. While we can quickly define the construction length with some accuracy, getting to that point could vary significantly. Having all team members on board from the outset is a great way to manage this. Our best advice is that as soon as you recognize the need, start building your team, even years away! Building everything at once: One way to overcome some of the expense in building is to spread it out over time. A Master Plan allows you to design your entire space, but only build what is needed in the immediate future. Other “phases” can be planned to attach to the first, or can be stand-alone projects. Often churches will plan all the site work and land expenses into the first phase so that the next ones are “pad ready,” which will take much less time, design, and permitting. Coveting other church’s facilities: “Have you seen XYZ church?” is a great way to show your design/build team what your intent is on achieving in your design. However, we see some churches looking to much larger facilities and wanting what they have, exactly. We encourage prudence in your growth. Having a large facility with no one to fill it can actually hurt your attendance! Remember, plan on “phasing” your project if you know that one day you will reach that desired size. Overlooking fellowship space: Much like the children’s areas mentioned above, modern church-goer’s have grown accustom to larger areas in the narthex or communal space outside of the sanctuary. Many churches are equipping these with cafés, bookstores, lounge areas, etc. The intent is so that your members don’t just come into the sanctuary then leave, but actually stay and visit with each other. Some facilities even stay open during the week and use the income to support church missions. Paying taxes on their purchases: Always make sure your builder has an Owner Direct Purchase (ODP) program and is adept at the intricacies of using it. Utilizing this process can save you from paying taxes on everything from mechanical equipment to major material purchases. To be successful, it must be efficient and concise. All of the savings can be rolled into better finishes for other areas, or the next phase! Involving the congregation only upon completion: Why wait until the end to celebrate with your congregation? There are many great milestones during the process to include your members. How about praying over the land? In the design process, open charrettes can be used to gather ideas. Once the design is settled, you can use 3D renderings and video fly-through’s to get everyone excited. As you get into construction, bring everyone in to write prayers on the concrete floors or hide them in the walls. The ideas are endless. Each serve as a method to make the process real for all, and in addition, you may find that the capital campaign gets a boost as well! Not praying: It is easy to get caught up and forget what we are doing. We are building an earthly house for God. We cannot expect to do that without prayer and consideration. Make prayer a part of the process. Pray for your project, the team members, especially your design/builders! If you find yourself in one or more of the above, don’t worry! Many churches have done the same and still been successful in achieving their vision. It all depends on the makeup of your team and purpose. Pray for guidance and get professionals to help you. Scherer Construction has made a commitment to help churches grow and expand responsibly. If you have questions, comments, or to speak about your project in specifics, please contact Mike at michaelbiagini@scherernfl.com. Or contact the NACDB office for a Design/Builder in your area info@nacdb.com.